There will be any women who do not like and do not wear jewelry. Young girls have far adorned themselves with the shiny accessory of their mothers. Elegant earrings. Glittering bracelets. Exquisite brooches. 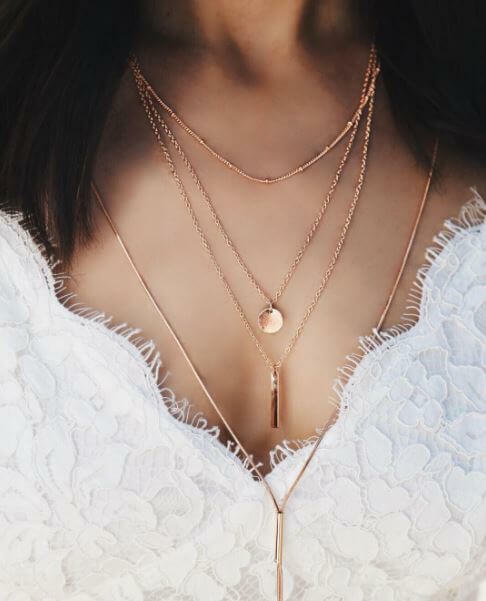 Delicate chains. It’s important to have pieces of jewelry that are timeless and look chic despite ever-changing fashions. But there is one accessory that stands out from all others. It might be enough to complete with a bit of drama even the simplest vision. It might revive even the most conservative way, which gives zest and originality. Let me introduce you, his Majesty the Necklace, and the top 10 trends you don’t want to miss this year. Nowadays, there is a thousand versions available on the market: velvet and leather, strap or with straps, metal or with rhinestones. Everything you need to do is to find your favorite and not to be afraid to wear it every day and with everything. It also can be an excellent choice if you want to create a seductive look because will gently emphasize your bust. First of all, it looks fantastic with a strapless dress or open shoulders. Second, the boohoo motive that comes with it is perfect for beach inspired look. And finally, your perfect tan will look even more impressive with a golden colored metal choker. For smart winter outfit, a big necklace can wear with a shirt and fine sweater. For the summer, you have unlimited options. Hint: Save this type of shine for special events. Necklaces with tassel details are favorites for the summer. They are easy to combine with a maxi dress or jeans and white top. But are also elegant enough to use them in your stylish suit look. Style note: The Slavic culture is always well known for its ethno colors. They should not be neglected! The chain necklace is a perfect match both for black skinnies and a tank top or tight dress in beige color. Be on the top of the trends wearing one with the huge pendant! The main rule for wearing chain necklace is one and massive or cascade mix. It is your decision! Put your favorite long or curves showing dress. Choose the large and impressive golden necklace with pendants and coins you can find. Go out with the confidence that you are ready for the Red Carpet. Style note: Black choker + some subtle layers in silver or golden color = Top of the Top! It is not a coincidence that Chanel has raised the pearls again in the begging of the century. Don`t miss them! The pearls are also excellent decision for an elegant wedding or special occasion. For an everyday look, you can wear colorful pearls in white, beige and gold and to accent them golden brooch for example. Don`t need anything more than your favorite brown sweater, a pair of jeans and simple long necklace. Choose the one with bow or heart accent if you want to add a bit of romantic touch. The flower necklaces are very romantic and chic. They can be your “Partner in crime” for a day in the office wearing a black suit and white shirt. A super choice for a wedding outfit. The balls and the Pearls have the same shape and look gorgeous together. Marrakesh necklace and Marrakesh necklace. Be ready all your spicy Orient dreams will come true. Style note: Your little black dress will love this new trend!